Justice Democrats Research Team | LEADS: HALEY ZINK and LINDSEY KELLY; VOLUNTEERS (who put in hundreds of hours to make this report possible): Fernando Arista, Nick Benoit, Joe Cheray, Matthew Darring-Yerk, Jamilah Elder, Josh Finkelstein, Kevin S. Grant, Bob Jacobson, Marin Kirk, Anirudh Madadi, Michael Henry Miller, Matt Morris, Jodi Newell, Emily Reck, Steven Rodriguez, Leigh Schmitt, Sylvia Szucs, Jackson Todd, Thierry Valat, and Asia Zanders. Special Thanks | JONATHAN COHN, who knows every roll call vote ever recorded; CHRISTOPHER SKOVRON, whose MRP estimates of opinion were instrumental in making this report possible; and MAX BERGER, who initially brought together this project. The Democratic Party is at a crossroads as the 2018 election approaches. Generic ballot polling, historical trends, and recent special elections suggest that Democrats will perform well in November, likely enough to take back the House of Representatives. But which Democratic Party will take the House? Will it be a Democratic Party ready to combat plutocracy, white supremacy, and militarism, or a Democratic Party ready to be complicit in continuing the policies that have harmed so many Americans? While pundits debate the future of the party, the Democratic Party’s base is united around policies that would create a fair economy for all, racial justice, and gender equality. Still, many in the party leadership and wealthy donor class express concerns that such policies will endanger the party. 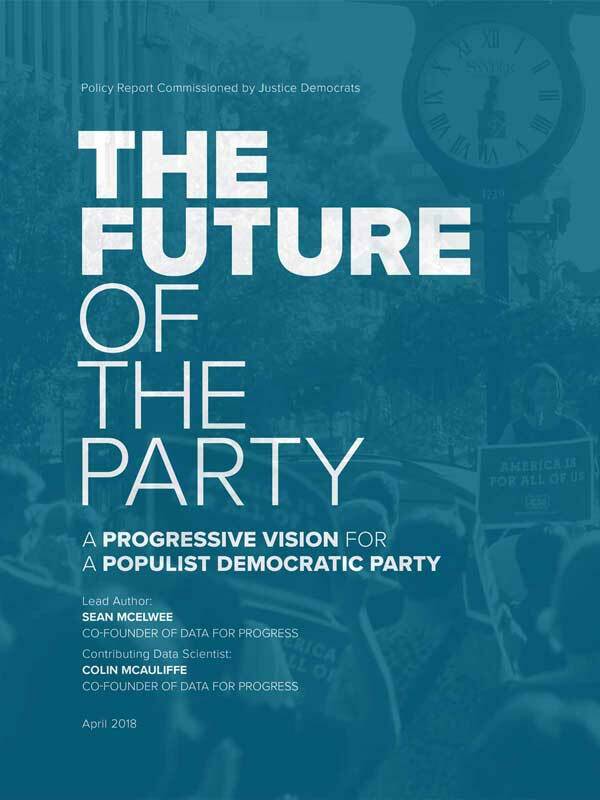 This report tackles these questions head on, demonstrating with polling data that the Democratic Party’s base has moved left, and voters are ready for a progressive agenda. Though the party elites may be “divided” the base is not; they are ready for unabashed progressive politicians. This report shows that a pivot toward the “center” is poison with the Democratic primary electorate, using historical data to show the increasing liberalism of Democratic voters on core progressive values. This report shows that marginal voters and nonvoters support key progressive policies and could form a durable base for the Democratic Party. This report shows that many Democratic incumbents are failing their constituents by opposing progressive policies with broad-based support. The Democratic base is ready for multi-racial populism. More than 90 percent of Democratic primary voters support a tax on millionaires and increased regulation on banks. Eighty-six percent of Democratic primary voters support a government guarantee of health care. Eighty percent support the government taking actions to reduce inequality. Eighty-five percent of Democratic primary voters support a path to citizenship, and nearly 1 in 5 believe that it should not involve any penalties. For the first time since it’s been polled, a majority of white Democrats are more likely to blame discrimination than “willpower” for racial inequality. It's time for a new nonvoter revolution. Nonvoters preferred Clinton to Trump 53/44.Full turnout would have lead to a Democratic Presidential victory in 2016. Nonvoters and marginal voters are more supportive of progressive policies. For example, 68 percent of nonvoters support increased regulation of big banks, compared to 52 percent of consistent voters. Democrats can win elections without rejecting their base. The general public supports key, over-the-horizon Democratic priorities, from marijuana legalization and ending mandatory minimums to a $15 minimum wage and single-payer health care. Medicare for All and a $15 minimum wage are popular in purple states across the country. Many Democrats reject policies supported by the general public in their states and districts. Ninety-two percent of Democrats in the House represent districts where modeled support for repealing the Hyde Amendment is greater than 55 percent, but only 70 percent of House Democrats support repealing the Hyde Amendment. Sixty-seven percent of Democrats in the Senate represent states where modeled support for Medicare for All is greater than 55 percent, but only 33 percent of Senate Democrats support Medicare for All. As they anticipate a wave election in 2018, many Democratic strategists have looked back fondly to 2006, when Rahm Emanuel was credited with shepherding the party to victory by recruiting business-oriented centrists to run in swing districts. This narrative has two key flaws. To begin, it’s unclear how much credit Emanuel deserves; models that were based on economic fundamentals and Presidential popularity predicted Democrats would pick up roughly the number of seats they did. More importantly, the voters of 2006 are not the same voters as the voters of 2018. In 2004, 65 percent of Democratic voters were white; in 2016,57 percent are. On key issues of racial justice and economic inequality, the Democratic base of 2018 rejects centrism. Many Democratic consultants and party leaders are still stuck in the 80s and 90s. Scarred from decades of being hit as “tax-and-spend liberals” concerned about “amnesty, acid, and abortion,” these party stalwarts worry that the party might be on the wrong side of racial justice. In The Atlantic, Peter Beinart argued that Hillary Clinton would have won the Presidency if she had gone to the University of California and rebuked them for calling the phrase “melting pot” a microaggression. In The New York Times, Mark Penn urged Democrats to move to the center and give up on defending sanctuary cities. In New York Magazine, Andrew Sullivan claimed that Ed Gillespie had a “killer instinct” for embracing anti-immigrant rhetoric, and that Democrats were committing “political suicide” by refusing to demonize immigrants. Gillespie, of course, lost the Virginia Gubernatorial election by 9 points and Democrats have gained 8 percentage points on voter trust on immigration over the last year. These sentiments may have made sense in the past, when many white Democrats held anti-immigrant and anti-black views, but they don’t make sense anymore. Democratic voters, Democratic primary voters, and the emerging Democratic base all reject this Third Way style of dog-whistle politics. Over the past several years, there has been a dramatic leftward shift among Democratic voters on a wide range of issues. The chart below shows that 2016 was the first year on record in which more white Democrats attributed racial inequality to discrimination, rather than lack of willpower among black people. This change has also occurred on immigration; Democrats are more supportive of a path to citizenship than ever before. The days in which Rahm Emanuel could tell the Democratic Party to “claim and achieve record deportations” are now gone. In 2006, Harold Ford Jr. and Jim Webb ran for congress unabashedly on anti-immigrant animus. Likewise, in 2010, half a dozen Democratic Senators voted against the DREAM Act. During the 2016 election, establishment Democrats had a powerful reckoning over their support for Wall Street, their role in creating mass incarceration, and the way they gutted the social safety net by supporting welfare reform. There has still been little discussion of the way that Democrats paved the way for mass deportation under Bill Clinton. The Illegal Immigration Reform and Immigrant Responsibility Act of 1996, a cynical attempt to endorse white supremacy for political gain, set the stage for mass deportation by dramatically expanding the share of undocumented immigrants eligible for deportation. However, Democratic voters have moved to the left in recent years. The 2016 Voter Study Group (VSG) survey is a panel survey involving the same participants, in both 2011 and 2016, allowing for an examination of shifting attitudes towards immigration policy by Democrats over the past several years. In 2011, half of consistent Democrats (who were Democrats in both surveys) said immigrants were mostly a contribution to society and 34 percent said they were a drain. By 2016, 67 percent of those same Democrats said immigrants were mostly a contribution, with 21 percent saying immigrants are mostly a drain. In the 2011 survey, 74 percent of consistent Democrats supported a path to citizenship, compared with 84 percent in the 2016 survey. This is consistent with other data sources. According to the American National Election Studies 2016 survey, Democratic primary voters are increasingly in favor of immigrant rights. The chart below shows that 85 percent of Democratic primary voters support some path to citizenship, with nearly 1 in 5 embracing the most radical version, in which all undocumented immigrants are able to apply for citizenship, with no penalties. The progressivism of the base is being driven by the rise of mobilized racial justice groups like Black Lives Matter and the “Dreamers.” Many young voters have warmer feelings toward movements like Black Lives Matter than towards established Democratic politicians. For instance, according to the American National Election Studies 2016 survey, young Democrats had similar feelings towards Black Lives Matter and Hillary Clinton. Older voters favored Clinton more, but still had positive feelings towards Black Lives Matter. During the 2006 elections, Webb also warned the “activist Left and cultural Marxists” engaged in “what might be called the collectivist taming of America, symbolized by the edicts of political correctness.” That year, nearly a dozen Senate Democrats voted to make English the official language of the United States and centrists like Harold Ford Jr. openly demonized immigrants. Democratic voters won’t tolerate dog-whistle politics, anti-immigrant rhetoric, and mass deportation. Democratic primary voters support a populist progressive agenda. The days are long gone when a message proclaiming ‘the end of big government’ could win a Democratic primary. From the 1970s to the aughts, a constant war was waged within the Democratic Party about how to address inequality, unions, and banks. In the 90s, the ascendant Clintonite wing argued that to win elections, Democrats should move right and become the party of small government. Under Clinton, long-standing New Deal policies and programs were dismantled and throughout the last three decades, inequality has increased unabated. As recently as 2010, Obama was willing to countenance cuts to Social Security as part of a “grand bargain” on entitlements. Some Democrats, like Senators Tom Carper (DE) and Mark Warner (VA), remain open to such a deal. Centrist Democrats will find little support from the Democratic base, where increasing government spending, reducing inequality, guaranteeing health care, regulating banks, and taxing millionaires are all supported by more than 4 in 5 primary voters. Despite the fact that more than 90 percent of Democratic primary voters support increasing regulation on banks, sixteen Democrats voted with Republicans to decrease regulations on banks in the 115th Congress. In a range of spending areas, Democratic primary voters support increases in government spending, and overwhelmingly reject cuts to government. Despite the fact that dozens of Democrats have signed on to support Social Security cuts, only 3 percent of Democratic primary voters support such cuts, and fully 68 percent support an increase to Social Security spending. Democratic primary voters support a populist progressive agenda that ties racial justice to progressive economic populism. The days are long gone when a message proclaiming “the end of big government as we know it,” could win a Democratic primary. Political scientists are increasingly skeptical of the ability of campaigns to persuade voters. An increasingly large body of research suggests that election outcomes are determined far more often by different levels of mobilization. For instance, examining validated vote data from the American National Election Studies dataset, only 34 percent of individuals who identify as Democrats voted in all three elections between 2012 and 2016, as well as 17 percent of Independents and 42 percent of Republicans. Only 10 percent of Democrats voted for Trump and only 8 percent of Republicans voted for Clinton. The path to victory is energizing and delivering to the base. Yet far too often, Democratic campaigns are designed to win over mushy milquetoast (and mythical) moderates, rather than excite the base. A study by political scientist Seth Hill finds that, “Swing voters contribute on average 4.1 percentage points to change in party vote shares, while change in turnout influences outcomes by 8.6 points.” In other words, the impact of mobilization on the electorate is about double the impact of persuasion. In a paper analyzing 49 field experiments, political scientists Joshua Kalla and David Broockman have shown parties have little capacity to persuade, but that campaigns can do much to mobilize voters, noting that, “our partner canvassing organization had effects of nearly 2.5 percentage points on turnout in the 2016 Presidential election.” The path to victory then, is energizing and delivering to the base. Yet far too often, Democratic campaigns are designed to win over mushy milquetoast (and mythical) moderates, rather than excite the base. Democrats have correctly blamed gerrymandering for their woes, but another key issue is that the voters that prefer them simply were not mobilized in 2016. But the 2016 election is only a snapshot: and not all nonvoters are the same. Some of those who didn’t vote in 2016 had previously participated in elections. To explore marginal voters, we analyzed the number of elections an individual voted in between 2012 and 2016. A person could vote in a maximum of three and minimum of zero. Individuals are about equally divided by group: 35 percent of adults voted in no elections, 30 percent voted in either one or two, and 35 percent voted in all three. Net Democratic support was calculated for each group (Democratic share minus Republican share). As the chart below shows, nonvoters and marginal voters have a preference for Democrats while the most consistent voters have a preference for Republicans. Democrats will do better if they get individuals who voted in only one election (mostly 2012) to become excited and turn out. There are deep demographic divides between who are marginal and nonvoters. While 66 percent of those who voted in none of the elections are white and 73 percent of those who voted in one or two elections are white, 83 percent of those who voted in all three elections are white. Only 30 percent of individuals who voted in all the elections between 2012 and 2016 make less than $50,000, compared to 57 percent of those who voted in no elections and 44 percent of those who voted in only one election. A bit more than a third of those who voted in none or one elections were under 30, compared to 6 percent of those who voted in three elections. Nonvoters or marginal voters are not just broadly more supportive of Democratic political candidates, they are also more supportive of key progressive priorities. To show this, we used the American National Election Studies to estimate support for progressive policy by the number of elections an individual had voted in from 2012 to 2016. As the following chart shows, individuals who voted in none of the elections between 2012 and 2016 were more liberal on a wide range of issues than individuals who voted in all three elections. Pundits often critique the left for being too optimistic about the potential of nonvoters, but the data suggest that progressives would benefit the most from mobilizing people who show up infrequently, in one or two elections. As the chart below shows, the preferred candidate of the poor was no-one, with nearly 1-in-2 not voting. Schumer was correct that Democrats performed well with the wealthy, but those voters make up a tiny, albeit influential, sliver of the electorate. These low-income nonvoters would overwhelmingly prefer Democrats if they voted, and would have been more than enough to shift the election outcome in favor of Democrats. Poor voter turnout from low-income voters was at least partially for lack of trying, as data from the Cooperative Congressional Election Studies 2016 show. The chart below shows reported contact rates by income. Even when examining only individuals who were matched to a voter file, or matched to a voter file and registered Democratic in a swing state (people we would expect Democrats to contact), there are deep class divides in reported contact. Among registered Democrats living in a swing state* earning less than $50,000, 65 percent reported contact, compared to an 80 percent contact rate among Democrats living in a swing state earning more than $100,000. Democrats also struggled to mobilize people of color, with Black turnout dropping off dramatically from 2012, and persistent racial gaps in turnout remaining. One possible cause is lack of aggressive mobilization. As the chart below shows, even when examining only individuals who are registered as Democrats, there were racial disparities in contact. There is also strong evidence that descriptive representation (young people, people of color, and women holding political office) increases turnout. The political implications of turnout are now well established in the academic literature. We can examine historical expansions of the voting electorate to explore the impact of increasing the voices of women and people of color. One study suggests that women’s suffrage increased government revenue and expenditures on children, as well as more liberal voting among congressional representatives. Another finds that women’s suffrage, by boosting government spending on health, reduced child mortality by 8-15 percent, preventing 20,000 child deaths annually. A study of the abolition of literacy tests for voter registration shifted the distribution of government funds to areas with larger black populations. The federalist nature of American democracy provides a “laboratory” which social scientists have used to study the impacts of turnout. In earlier studies, political scientists Kim Hill and Jan Leighley found that states with a more pronounced class bias of turnout tend to have lower rates of social welfare spending. Other research shows more obvious partisan implications. A study by political scientist Anthony Fowler finds that, compared to off-cycle gubernatorial elections, on-cycle elections “increase turnout by 17.4 percentage points and the Democratic candidate’s vote share by 6.4 percentage points.” Another study established that full turnout in 2008 and 2010 would affect many Senate and Gubernatorial elections, weakening the blows that Democrats face in those midterm elections. Given the implications of these victories, it’s important to consider: Hundreds of thousands of people may lose healthcare because of Matt Bevin’s 2015 victory in Kentucky, and his embrace of right-to-work could easily cost Democrats future elections. The rise of right-to-work may have cost Clinton two states (Michigan and Wisconsin) and could further entrench Republican state-level power. 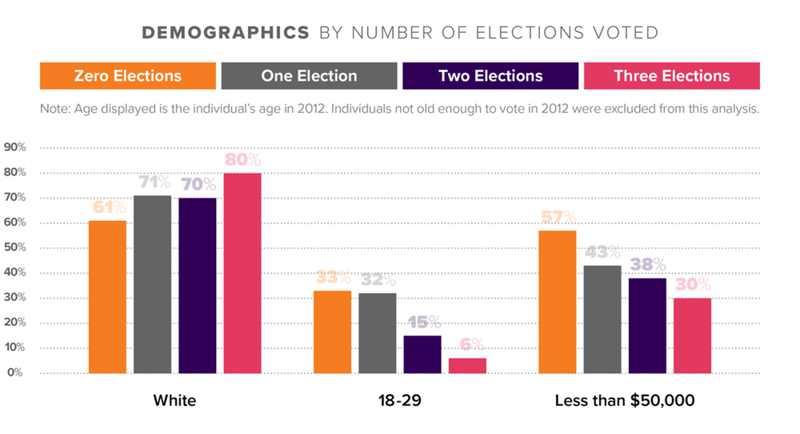 As the chart above shows, young, low-income people of color are far less likely to vote than older, rich people and this gap is particularly accentuated during midterm elections. Mobilizing nonvoters and drop-off voters would create more space for a progressive agenda. It’s clear that the Democratic base is ready for a more progressive party, and that mobilizing nonvoters and winning back the Obama coalition are a key path forward for Democrats. Even so, many commentators still warn that the party might face an electoral backlash if they embrace their base. Politicians from both parties dramatically overestimate the conservatism of the voters they represent. However, there is hope; research from political scientists Daniel Butler and David Nickerson suggests that when politicians are given accurate polling about their constituents, they move to align their policies with constituents. Examining policies such as the minimum wage and racial justice, as well as tax policy, we find that Democrats are wrong to target the mushy middle. In fact, there is durable and consistent support for even over-the-horizon progressive policies across the country. Voters reject mandatory minimums, which have inflamed mass incarceration. Voters also reject the Hyde Amendment, an unnecessary limitation on a woman’s right to choose. Voters are more than ready for the Environmental Protection Agency (EPA) to take action on climate change and new investment in infrastructure. In addition to national support for these issues, we used the multilevel regression and poststratification model developed by think tank Data for Progress to model state level support for two key over-the-horizon policies: a $15 minimum wage and Medicare for All. First, Data for Progress estimated support for Medicare for All using data provided by the Kaiser Family Foundation, and found high levels of support across the country, with 54 percent support in the median state. There are 42 states and the District of Columbia in which modeled support for Medicare for All is greater than 50 percent. In the two where progressives are most aggressively pushing Medicare for All, New York and California, we estimate 63 percent support and 62 percent support respectively. Even in states where Medicare for All is least popular, support is still reasonably high, with 45 percent of individuals in Wyoming and 46 percent of Utahns supporting Medicare for All. Second, using data from the Pew Research Center, Data for Progress estimated support for a $15 minimum wage, which ranges from 92 percent support in the District of Columbia and 74 percent in Maryland to 34 percent in Wyoming. In the median state, modeled support was 54 percent and there are 33 states and District of Columbia in which support is greater than 50 percent. There is more variation in support for a $15 minimum wage than with Medicare for All, but it is still popular in the vast majority of states. *Despite having similar support in the median state as Medicare for All, our estimate of the number of majority states is lower because support for the $15 minimum wage is more polarized geographically. For the purposes of modeling support accurately, individuals who didn't know were included in the model, a relatively conservative assumption. Both Medicare for All and a $15 minimum wage have majority support, even including individuals who didn't express a preference, indicating durable support for both policies. 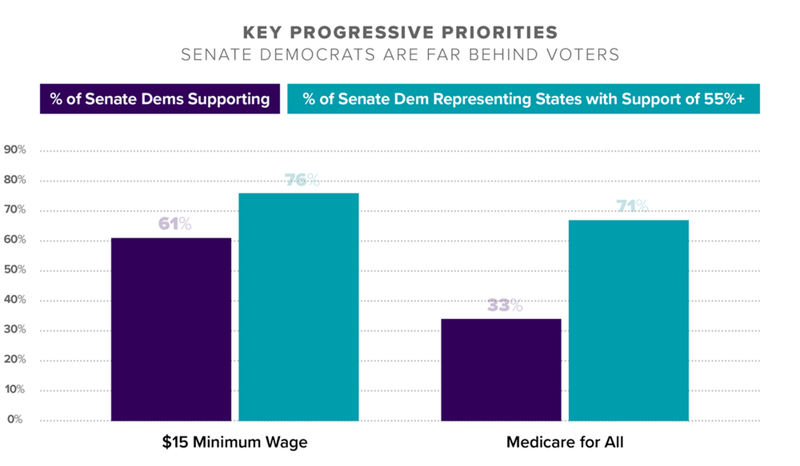 In most states, Democrats can embrace progressive policies like a $15 minimum wage and Medicare for All. Despite widespread support for these policies, many Democrats have remained staunchly in the past. Many Democrats vote more conservatively than a generic Democrat would be expected to vote. To examine House Democrats who are most out of line with others on key progressive priorities, Justice Democrats volunteers compiled data on the voting records of every Democrat on the twelve key issues. For those who did not co-sponsor these bills, or were not in Congress at the time, we sought to find public support on their campaign page. If unavailable, we reached out to their office or used publicly available comments in the press, in social media, or on the candidate’s website. We erred on the side of generosity when we could. For each representative we created a “generic Democrat” based on a logistic model using Trump’s margin in the district, the share of their district that is white, the share of their district with a college degree, the median income of their district, and, when available, modeled support for the relevant policy in their district. For each representative we ran a model without them in the dataset, and estimated the probability of them supporting the policy. We then compare this modeled generic Democrat to their actual voting record. For individuals who do not support the policy, we code it as “very likely” that a generic Democrat would support the policy if the low end of the 95th percent confidence interval is below 50 percent. We code as “likely” if the predicted probability of support is above 50 percent, otherwise, they are coded as “unlikely” to support the policy. To be clear, this is a relatively conservative way to judge whether a Democrat should have supported the legislation—we are comparing them to observed behavior of other congress members, rather than what they plausibly do. There is evidence that Democrats misperceive their electorate and could move left on many issues. However, even with these relatively conservative assumptions, we still find evidence that many Democrats are to the right of where they could be. All of these Democrats represent districts Clinton won by at least 20 points, but do not currently support Medicare for All. On average, Clinton won their districts by 44 percentage points. Our model suggests that a generic Democrat representing fourteen other Democratic districts would also support Medicare for All. If every member who currently does not support Medicare for All, but who the model predicts would support it, were replaced, support for Medicare for All would increase from 63 percent of the House Democratic caucus to 78 percent of the House Democratic Caucus. With the exception of Ron Kind, all of these Representatives hail from districts Clinton won. On average, Clinton won these districts by 22 points. Our model suggests another four Representatives would be likely to support a $15 minimum wage (see appendix on page 30.) If every member who currently does not support a $15 minimum wage, but who the model predicts would support it, were replaced, support for a $15 minimum wage would increase from 87 percent of the House Democratic caucus to 97 percent of the House Democratic Caucus. By replacing every member who currently does not support repealing the Hyde Amendment but who the model predicts a generic Democrat would be likely or very likely to support, support for repealing the Hyde Amendment would increase from 70 percent of the House Democratic caucus to 92 percent of the House Democratic Caucus. Examining all issues, we performed a relatively simple experiment: what would happen if the most conservative Democrats (relative to their electorates) were replaced by generic Democrats representing their electorates. The chart below shows the results of this experiment. For some issues, very little changes, because there is so little support among incumbent Democrats that our model doesn’t predict much would change. But on other issues, like a $15 minimum wage, infrastructure modernization, Medicare for All, a path to citizenship and repealing the Hyde Amendment, the model predicts Democrats could be far more progressive, based solely on the voting records of incumbent Democrats. Our model estimates that half of the Democratic caucus would support a millionaire’s tax if all Democrats opposed to the policy were replaced by generic Democrats. Because our model is based on actual voting records, in many cases, our model doesn’t predict that many more House members would support a policy. The reason is so few other Democrats support the policy. However, for some of the issues examined, we can analyze modeled support in these districts generated by political scientist Christopher Skovron. We find that on key issues Democrats across the board are far behind public opinion in their districts. The chart below shows the percent of House Democrats that support each policy, and the share of House Democrats who represent districts where support for the policy is greater than 55 percent. As the chart above shows, Democrats have quite a bit of space to move left on these issues,particularly issues like ending mandatory minimums and regulating CO2, which have high levels of support. On other issues, we don’t have district level opinion data, but national polling data suggests there is evidence that Democrats are being too conservative. For instance, legal marijuana has rapidly growing support in public opinion surveys, but only 26 percent of House Democrats support it. For those who had not taken a position on these issues, we sought to find public support on their campaign page. If we could not find this, reached out to their office or used publicly available rhetoric. We erred on the side of generosity when we could. Our model suggests that if Senators Dianne Feinstein (CA) and Chuck Schumer (NY) were replaced by generic Democrats, those Democrats would be very likely to support Medicare For All. If Tammy Duckworth (IL), Jack Reed (RI) or Richard Durbin (IL) were replaced by generic Democrats, their replacements would be likely to support Medicare for All. These Democrats represent states Clinton won by more than 15 points. On average, Clinton won their districts by 20 percentage points. Our model suggests that if Michael Bennet (CO) and Angus King (I-ME) were replaced by generic Democrats, those Democrats would be very likely to support a $15 minimum wage. Tina Smith entered the Senate shortly before the report was published and has not yet endorsed a $15 minimum wage, but our model would predict that she would support a $15 minimum wage. These Democrats represent states Clinton won by 6 points on average. The chart below shows the results of this experiment. Support for a $15 minimum wage increased from less than two-thirds of Senators to four-fifths. Support for a tax on Wall Street increased from 39 percent of the causus to a bit more than half. In addition to the Skovron state-level MRP estimates, we can compare Senate behavior to the Data For Progress modeled support for Medicare for All and a $15 Minimum Wage maps above. In every state represented by a Democratic Senator, there is 55 percent or greater support for the Environmental Protection Agency (EPA) regulating carbon dioxide, but only five Senators have supported the 100 by ‘50 plan to transition the United States to renewable energy. Eighty-six percent of Democratic Senators represent states where support for repealing the Hyde Amendment is 55 percent or greater, yet some like Tim Kaine have still expressed support for the Hyde Amendment (57 percent of Virginians oppose the Hyde Amendment). Three in four Senators represent states with 55 percent support for a $15 minimum wage. And more than two-thirds of Senators represent states where more than 55 percent of people support Medicare for All, but only one in three support Medicare for All. We did not analyze mandatory minimums, because the issue is not currently on the agenda in the Senate, though we find broad public support: in every state represented by a Democratic Senator, support for ending mandatory minimums for non-violent crimes is greater than 55 percent. In the average state represented by a Democrat, support is 69 percent. We also examined support for three key environmental policies nationally: fuel efficiency standards, a renewable fuel mandate, and allowing the Environmental Protection Agency (EPA) to regulate CO2. All of these policies have greater than 60 percent support in the median state, with fuel efficiency standards garnering 74 percent in the median state. According to the American National Election Studies 2016 survey, 72 percent of Democrats, 68 percent of Independents, and 45 percent of Republicans (excluding individuals who said they didn't know) support legalizing marijuana. Legalizing marijuana is also popular with individuals under 40, with 74 percent supporting legalizing marijuana, compared with 53 percent of those 40 or older. More than 4 in 5 young Democrats support legal marijuana and even young Republicans are supportive (61 percent). In addition, private polling of deep red districts suggests that even there, legal marijuana garners strong support. There's little evidence that a progressive agenda would alienate voters, but it could build the party of the future. Democrats need a party that includes the millions of Obama to nonvoters to win in 2018. For too long the Democratic Party has tried to adopt the rhetoric of white supremacy and the policies of plutocrats. No more. The time for half-measures is over. For full citations and Senate and House Appendices, please download the full report. Thank You: Jonathan Cohn, who knows every roll call vote ever recorded. Christopher Skovron, whose MRP estimates of opinion were instrumental in making this report possible. Max Berger who initially brought together this project. Most importantly, Haley Zink, Lindsey Kelly, and the volunteers who put in hundreds of hours to make this report possible: Fernando Arista, Nick Benoit, Joe Cheray, Matthew Darring-Yerk, Jamilah Elder, Josh Finkelstein, Kevin S. Grant, Bob Jacobson, Marin Kirk, Anirudh Madadi, Michael Henry Miller, Matt Morris, Jodi Newell, Emily Reck, Steven Rodriguez, Leigh Schmitt, Sylvia Szucs, Jackson Todd, Thierry Valat, and Asia Zanders.